Common knowledge says that the Marshall Plan was responsible for Germany's rapid economic growth, but that's a mistaken view. Many different political projects have been dubbed as socialist successes by the Left over the last century. At least they were dubbed as successes at first because, as we always found out afterward, the failures and misery which followed obviously showed that this wasn’t real socialism. The list is long, going from the Soviet Union, Maoist China, Cuba, Latin America to even countries like North Korea. But with the ongoing failures of classic socialist examples — most recently Venezuela, Argentina, and Brazil — it seems like the Left has resorted to looking to continuously successful economies as versions of what they might call moderate socialism, or “democratic socialism.” Scandinavia is most often used in this new strategy. Disproven a thousand times — even by the Danish Prime Minister himself, who declared in 2015 that “Denmark is far from a socialist planned economy, Denmark is a market economy” — it is nonetheless used frequently. Of course, it would be great for the Left to lay claim to the success of Germany. And sure, Germany is indeed a country that has lived under extreme economic interventionism over a long period. Private property did still exist in name – the problem: nothing could be done with it. Otto von Bismarck, Chancellor of the German Empire from 1871 to 1890, set up the first modern welfare state as we know them today. He found lots of helping hands in the historicist school led by Gustav Schmoller, which not only had the famous “Methodenstreit” (i.e. the methodological debate) with Carl Menger and the up-and-coming Austrian School of Economics but also continuously argued in favor of state intervention into the economy. The dark economic history of Germany continued with excessive money printing which led to the hyperinflation of 1923, and then the rise of the collectivist right. When Hitler got into power, the Nazis regulated the economy to death. It’s true that they weren’t socialists in the way that they communalized all property. Instead, private property did still exist in name — the problem: nothing could be done with it. There were no more entrepreneurs who could use their property to innovate. There were mere “Betriebsführer,” i.e. “works managers,” who led businesses by solely following the commands of central planners. The economy slumped, people were close to starvation, and after World War II, the entire country was in ruins. But the indeed socialist — or at least interventionist — past of Germany took a turn post-World War II. And with the now so famous, and even more so mystical “Wirtschaftswunder,” i.e. “economic miracle,” started off the success story seen over long periods since then. Common knowledge says that the United States’ Marshall Plan was responsible for the rapid economic growth, rebuilding the country by throwing a lot of money at it. But that's a mistaken view — and an important one, because to this day it helps perpetuate the myth that nation-building such as in the Middle East or sending billions of dollars of aid to Africa works in any way ("It worked in Germany, so ..."). Marshall Plan aid to West Germany was not that large. Cumulative aid from the Marshall Plan and other aid programs totaled only $2 billion through October 1954. Even in 1948 and 1949, when aid was at its peak, Marshall Plan aid was less than 5 percent of German national income. Other countries that received substantial Marshall Plan aid exhibited lower growth than Germany. So, why was there a "Wirtschaftswunder"? Henderson gives two main reasons: a monetary reform and the freeing of the economy by abolishing price controls and cutting taxes. All of this was implemented thanks to one man: Ludwig Erhard. Erhard, who had lost his pre-WWII job because he refused to join the Nazis, was the perfect man for the Allies’ goal of de-Nazification. But even better for advocates of free markets, he was influenced by the likes of Wilhelm Röpke, Friedrich Hayek, and especially the Freiburg School, a group of economists led by Walter Eucken who advocated for ordoliberal policies. Ordoliberals don’t advocate for completely free markets, but pretty darn close: They want the state to only set the framework, provide some small welfare services, and use anti-trust measures when monopolies start to build. What has taken place in Germany … is anything but a miracle. It is the result of the honest efforts of a whole people who, in keeping with the principles of liberty, were given the opportunity of using personal initiative and human energy. ... in 1947, the amount of money in the German economy — currency plus demand deposits – was five times its 1936 level. ... The basic idea was to substitute a much smaller number of deutsche marks (DM), the new legal currency, for reichsmarks. The money supply would thus contract substantially ... The net result was about a 93 percent contraction in the money supply. It set up the German Mark to become the preferred currency in Europe for decades. Still afraid of a return to the hyperinflationary period of the 1920s, the German Bundesbank never inflated the money to the same extent as almost all other countries. The Mark was by no means a stable currency and quickly lost value as well. But it was in much better shape than all other European currencies. So much so that it put pressure on other national central banks not to print too much money either. It was just one reason for less stability-oriented governments to suggest the implementation of a common European currency — the French President Francois Mitterand even made it a condition for German reunification: You are in favor of the euro or else there’s no reunified Germany. In this context, the proposal by Philipp Bagus that German Chancellor Helmut Kohl should have just left Germany as two states seems at least worthy of consideration. West Germany could have left its relatively modest monetary policy instead of having to adopt the excessive one conducted by the ECB ever since. Erhard was Chancellor from 1963 to 1966, but when he was gone the country once again slowly adopted more interventionist policies — especially by increasing the scope of the welfare state. 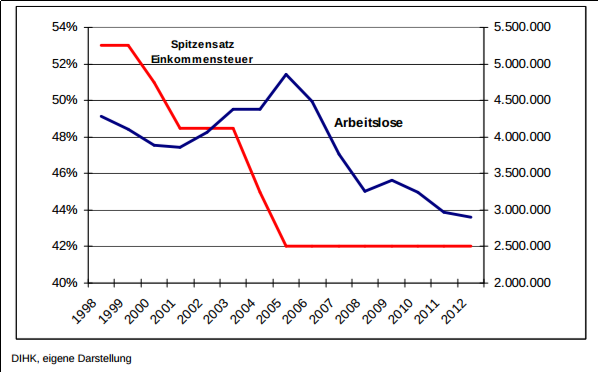 In the 1990s, the German economy once again slumped — though nowhere near as close as fifty years before of course. The solution would have been another radical reform in favor of the market economy. Instead, Germans chose the second-best option: gradual, moderate reforms. By international comparison, the economy became much more competitive. First, labor unions did something that would be impossible in countries that have similar problems today — like France and Greece — as Germany did two decades ago: They let the market work by letting labor costs decrease rapidly, and, by international comparison, the economy became much more competitive — especially since labor costs increased in other European countries. “Agenda 2010” set off the current success story of Germany. But with success comes danger: The danger of taking it for granted. This is the path Germany is following right now. While Schröder implemented the reforms, Merkel takes the credit for the economic growth seen. In the meantime, she has not followed through with her plans to free the economy even more. Instead, she has possibly become the most left-wing Chancellor in post-war Germany. Over the years, Germany has introduced a minimum wage, lowered the pension age (despite the impending system bust), adopted a costly energy transition by massively subsidizing renewable energies, and has financed a huge, subsidized migration wave which costs German taxpayers a tremendous amount of money (reports say $86 billion over only the next four years). Thanks to economic interventionism, it is just a matter of time. It is questionable how long this course can still be taken, when the tide will turn, and less stellar results will come — thanks to economic interventionism, it is just a matter of time. In an 1862 speech Ferdinand Lassalle, an early German socialist, coined the term “Nachtwächterstaat” — the night-watchman state. Of course, Lassalle used the term in a ridiculing way. But what Germany needs at this moment is just that. Not due to socialism, but thanks to Ludwig Erhard’s radical pro-market reforms, the modest monetary policy by the Bundesbank over decades, the internal devaluation of the 1990s, and the reforms of Gerhard Schröder and the Social Democrats in 2004, Germany is successful today. It’s time that Angela Merkel, leader of the CDU, the party of Ludwig Erhard, realizes that and once again adopts principles that truly reflect economic liberalism. It’s unlikely of course — but one can still hope.